From time to time, particularly around Mother’s Day, a day comes when kids and dads spoil moms. Spa days, going out to eat, doing extra chores, writing sweet notes—these are all ways that we treat our moms on those special days. What happens when that day is over, though? How can dads continue to give stay-at-home moms a break every day? 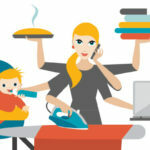 In the job of being a stay-at-home mom, days are full of highs and lows, incessant answering of “why,” driving all over town, and endless chores. In fact, it’s been determined that a stay-at-home mom should be making a salary of $143,102 and is working the equivalent of 2.5 full-time jobs! Being a parent is tough, whether staying at home or working full-time, but stay-at-home moms are in a particular position to need a break from the constant runny noses, fights with siblings, and spilled snacks. Before getting into the list of ways dads can help out, we acknowledge stay-at-home dads who also need help, working dads and working moms who are tired and stressed, as well as many families who share responsibilities in other ways best suiting their individual family. However, this list is intended as specific ways to help out those stay-at-home moms holding down the fort and fulfilling the daily duties of running the house and caring for the kids. 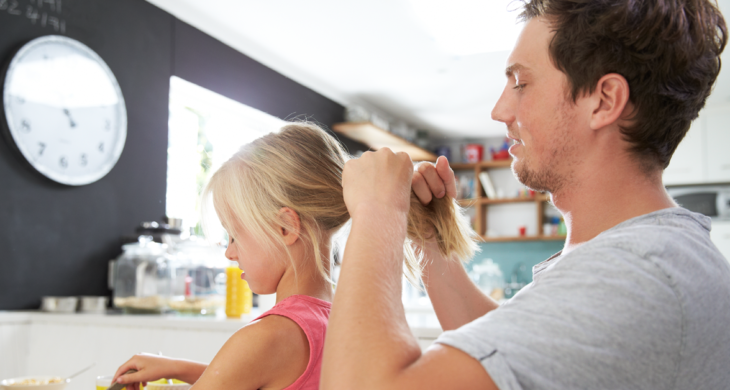 Here are seven everyday ways that dads can help support and give stay-at-home moms a break from their responsibilities and routines. 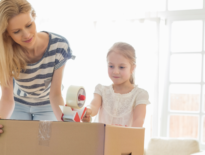 Handling this simple chore can be a critical break for moms. By the time the groceries have been bought and put away and the meal prepared, the very last thing she wants to do is clean up. So, grab the sponge and tell her to sit down! Adding grocery store trips in the midst of her day with tired or hyper kids in tow can be an exhausting and overwhelming venture. Help take this off her plate by grabbing the kids on the weekends and making it a fun time with daddy buying groceries for the coming week. This gives you a perfect opportunity to talk to the kids and have one-to-one time catching up from your family’s busy week! After Mom’s long day caring for the kids and the house, you taking responsibility for getting the kids bathed, teeth brushed, and tucked into bed will give Mom the chance for some alone time or even a night out with her friends. These bonding moments will also make for great memories reading bedtime stories or creating bubble hair in the tub! We all know the woes of having to pay bills, deal with insurance, schedule appointments, and the many other administrative tasks involved with running a home and family. 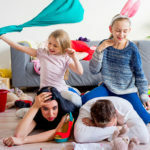 Phone calls and focusing on the details of finances can be extremely difficult with the noise and chaos that fills a home with little ones. Handling this yourself so she doesn’t have to try to make phone calls with a crying baby in her ear can be a huge relief for a stay-at-home mom. Whether she enjoys coffee or tea or something else, have it ready for her in the morning. Most moms deal with exhaustion every day, so helping to get her awake and ready for the day with this simple gesture will be a daily reminder that you love her and are there to support her. While it may seem obvious, letting Mom sleep in or taking the kids outside so she can take a nap during the day helps make up for sleepless nights awake with the kids. 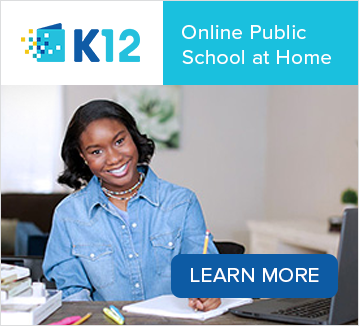 School days start early, so try scheduling one morning each week that she gets to sleep in while you get the kids ready and out the door. Above all else, make sure you are regularly asking and looking for ways to help out. If Mom seems particularly stressed, ask what you can do to help. If you are noticing she is always tired or always on her last frayed nerve, have an honest and open-minded talk with her about specific things you can do to help best support her as your wife and as a stay-at-home mom. It may not be any of the above ways and something completely unique to her and her needs! Moms and dads both work so hard to provide a good life for their kids—doing their best to keep them safe, healthy, and happy 24 hours a day, seven days a week. 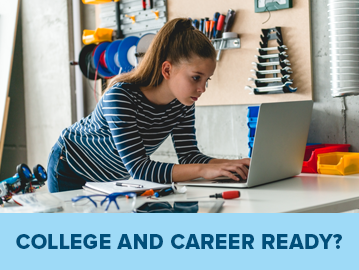 This is tiring and stressful work, and a cooperative balance of roles and responsibilities within the home is needed to keep both Mom and Dad from burning out. Keep those lines of communications open to know the most effective ways for kids and dads to give stay-at-home moms a break—and vice versa!